The Jouvé skin care system was designed to help you look and feel your best. 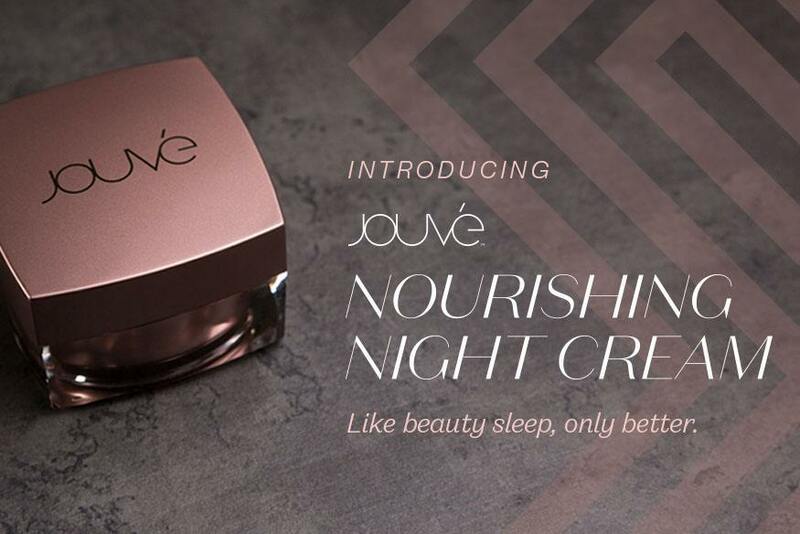 Now we’re taking Jouvé to a whole new level with the launch of our newest cutting-edge product, Jouvé Nourishing Night Cream. This intensive cream provides your skin with a nighttime skin care boost, so that when used as a comprehensive regimen, Jouvé offers your skin 24-hour, safe and effective support with the very best ingredients and proven clinical results. Every night, your skin undergoes an essential restorative process. Nourishing Night Cream enhances this process, giving your skin a much-needed beauty refresh through high-quality, clinically proven and clean ingredients that help diminish the visible signs of aging and fatigue. Say goodbye to dark circles, under-eye bags and dull skin and hello to a fresh and flawless complexion every morning! While the results speak for themselves, what makes this product even better are the incredibly clean ingredients rigorously sourced from around the world. Let’s take a look at a few of the ingredients that make Nourishing Night Cream so effective and so special. Prodizia (Albizia Julibrissan Bark Extract): Derived from the Persian silk tree, this extract assists the overnight process that helps skin look more rested and refreshed by visibly reducing signs of fatigue. Buddleja Stem Cells: Extracted from the butterfly bush, these smart plant cells help your body’s natural renewal process to protect while soothing and calming the skin. 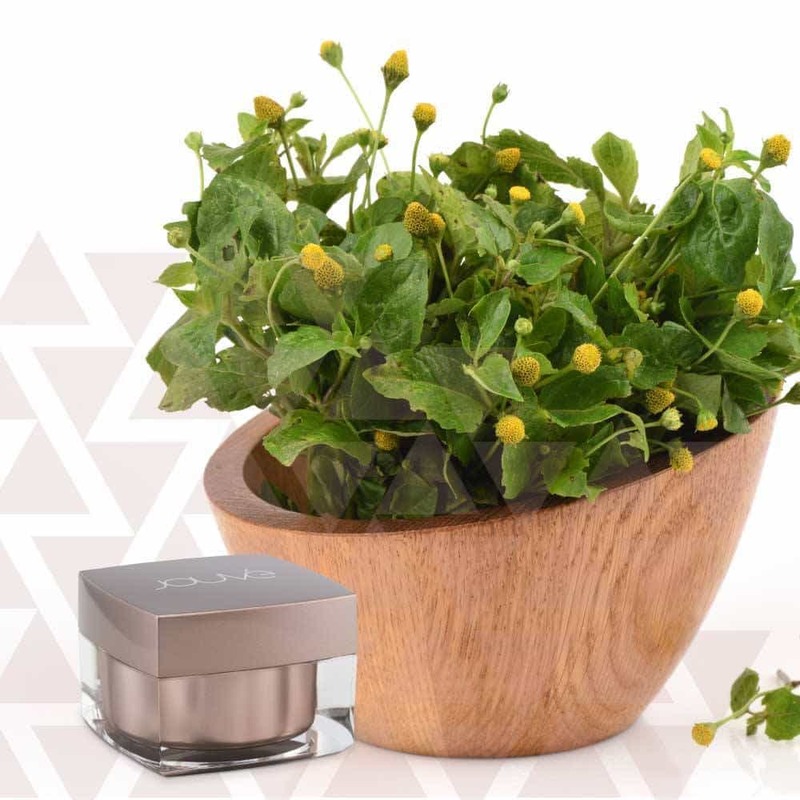 Gatuline® In-Tense: From the flowers of the Spilanthes Acmella plant, this extract helps skin feel more firm and tight. Redde Complex: This natural, multifunctional ingredient contains antimicrobial properties and helps retain moisture and rejuvenate skin. 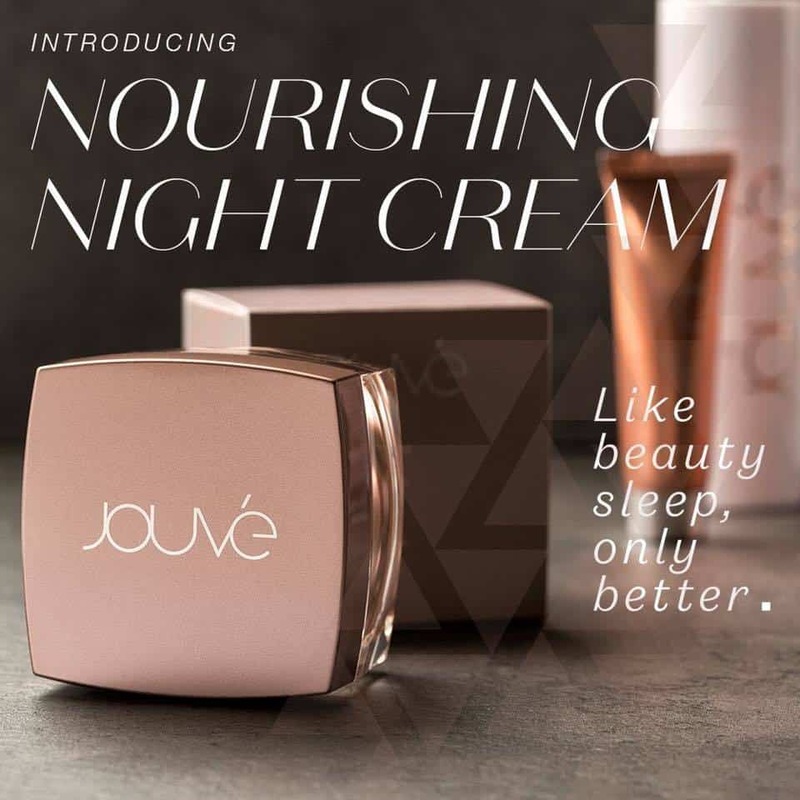 Jouve Introduces "Nourishing Night Cream"
As the newest member of the Jouvé skin care system, Nourishing Night Cream easily fits into your daily routine. In a few simple steps, you’ll achieve flawless skin day and night. 1) After cleansing skin, apply Dark Spot Corrector and Brightening Cream, allowing a few minutes for it to absorb. 2) Next, apply Instant Tightening and Restoring Serum to fine lines, wrinkles or puffiness under the eyes to complete your youthful look. 1) After cleansing skin, apply Dark Spot Corrector and Brightening Cream for maximum brightening results, allowing product to fully absorb into skin. 2) Follow it up with an application of Nourishing Night Cream at least 15 minutes before bed for maximum absorption. 3) Wake up looking rested, refreshed and your beautiful best! With the addition of Nourishing Night Cream, Jouvé now offers a full-spectrum skin care solution that keeps you looking your best all day, every day. Be sure to get your beauty sleep in a bottle today by clicking here! You may feel tired, but you won’t look tired. Give a much-needed beauty boost to your skin’s restorative night-time process with this nourishing and intensive night cream. Generously formulated with high-quality, clinically tested and clean ingredients to diminish the visible signs of aging and fatigue. Wake up with skin that looks and feels more youthful, vibrant and refreshed. Water, Glycerin, Coconut Alkanes, Butyrospermum Parkii (Shea) Butter, Glyceryl Stearate, Cetyl Alcohol, Helianthus Annuus (Sunflower) Seed Oil, Caprylic/Capric Triglyceride, Lauryl Laurate, Leuconostoc/Radish Root Ferment Filtrate, Maltodextrin, Albizia Julibrissin Bark Extract, Buddleja Davidii Meristem Cell Culture, Sodium Hyaluronate, Camellia Sinensis Leaf Extract, Cucumis Sativus (Cucumber) Fruit Extract, Argania Spinosa (Argan) Kernel Oil, Acrylates/C10-30 Alkyl Acrylate Crosspolymer, Salicornia Herbacae Extract, Simmondsia Chinensis (Jojoba) Seed Oil, Sodium Hydroxide, Coenochloris Signiensis Extract, Citrus Grandis (Grapefruit) Fruit Extract, Salvia Officinalis (Sage) Leaf Extract, Lecithin, Citrus Medica Limonum (Lemon) Peel Extract, Hydroxyacetophenone, Spilanthes Acmella Flower Bud Extract, Coco-Caprylate/Caprate, Stearic Acid, Lavandula Angustifolia (Lavender) Flower/Leaf/Stem/Extract, Xanthan Gum, Pyrus Malus (Apple) Fruit Extract, Sodium Phytate, Aloe Barbadensis (Aloe Vera) Leaf Juice, Sodium Stearoyl Glutamate, Tocopheryl Acetate, Vanilla Planifolia Fruit Extract, Citric Acid.